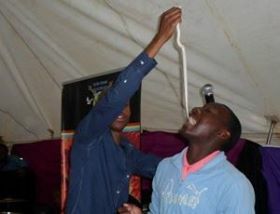 The preacher who was seen in a photo online feeding his congregation a ‘live snake’ has been arrested by the police. The photo of Prophet Penuel Mnguni of End Times Disciples Ministries went viral on social media. He allegedly gave his congregation live snakes to eat, telling them it would taste like chocolate. According to the reports citing Ga-Rankuwa police,the Pretoria based preacher has been arrested on Sunday and is likely to appear in the Ga-Rankuwa Magistrate’s Court on Monday on charges of cruelty to animals. Earlier in the week, the South African branch of the Society for the Prevention of Cruelty against Animals (SPCA) had warned the preacher to keep his hands off live animals.